Chennai Super Kings has stretched their lead at the top of the points table after the win against Kolkata Knight Riders. 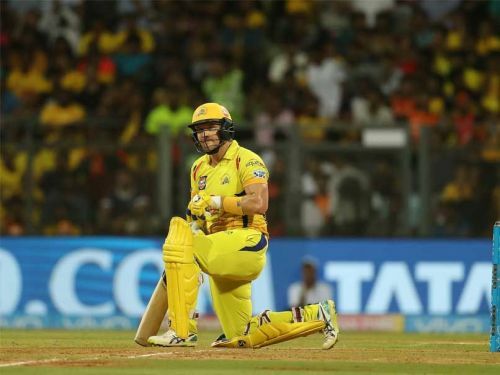 CSK will now face Sunrisers Hyderabad in yet another away game in IPL 2019. With seven wins in eight matches, looks like a favourite to be the first team to make the playoffs. However, Dhoni & Co. will not be complacent and will look to win the next couple of matches and seal a place in the top two. CSK has tweaked it's playing XI quite a lot this season and despite being at the top of the table, the team is yet to settle on a fixed playing XI. Here is CSK's predicted playing XI for the game against Sunrisers. From the time Faf du Plessis has come into the playing XI, he has provided solidity to the fragile looking CSK top order. The South African skipper has scored 128 runs in four matches. But Shane Watson's poor form will be giving headaches to the team management. Having said that, Watson is expected to be given a couple of more chances in the playing XI. Suresh Raina showed the importance of experience with a mature knock against KKR. The team is also likely to back the out of form Ambati Rayudu, who was left out of India's World Cup squad, to come good. MS Dhoni will look to continue his good form with the bat in IPL 2019. Ravindra Jadeja and Mitchell Santner have delivered for the team in crunch situations with the bat and have been stable with the ball. Santner is likely to keep his place until Dwayne Bravo is completely fit. Deepak Chahar has been exceptional with the new ball for CSK. In the absence of Dwayne Bravo, he has also shouldered the responsibility of bowling in the death overs. Shardul Thakur, who has got a bit of sticking in previous matches, bowled well against KKR. Tahir will be key against the likes of Warner and Bairstow. Follow Sportskeeda for all the updates on IPL points table, schedule, news, live scores, orange cap, purple cap and fantasy tips.